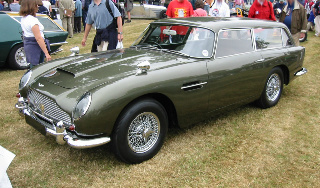 The Aston Martin DB4 sports car evolution ended with the DB4 GT Zagato, production of which ceased in 1963. This was succeeded, in late 1963, by the Aston Martin DB5, a luxury 2+2 fixed head coupe, that was designed by the well know Italian coachbuilder Carrozzeria Touring Superleggera, and included covered headlights. It was powered by an alloy 4 litre, straight-six, DOHC engine, that developed 282 bhp at 5500 rpm, and 288 ft/lbs of torque at 3850 rpm. Fitted with a David Brown five speed manual gearbox (all synchromesh ZF box as an option, as was a three speed Borg Warner automatic), an 8.9:1 compression, and triple SU carburettors, it produced a top speed of 143 mph, with a 0-60 mph time of 8.1 secs. It had magnesium-alloy body panels on a steel platform chassis, with a curb weight of 1565 kg, which produced both light weight and strength, plus Girling disc brakes all round. In terms of the interior, standard fitments included leather trim, deep woollen carpets, electric windows, reclining seats, wire wheels, and even an oil cooler. When production ended in 1965, 887 units of the DB5 coupe had been built. The DB5 subsequently developed a following who regarded it as the most desirable and beautiful of all cars produced by Aston Martin up to that time. In an historical footnote, the original prototype DB5, plus an additional standard DB5, were used in the 1964 James Bond film "Goldfinger", as well as being showcased at the World Fair in New York that same year. In October 1963, the convertible variant was introduced, with body styling also by Carrozzeria Touring of Milan, and priced at £4,490, a 5% premium to the coupe. An interesting distinguishing feature was that the dashboard was finished in the same colour as the external panels. A steel hardtop, with an unusually large rear window, was offered as an optional extra. The power plant and mechanics were as per the coupe. 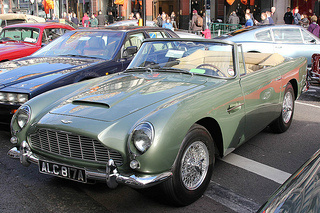 With production of the coupe ending in 1965, from October 1965 for the next 12 months, the convertible used the remaining 37 DB5 chassis, and was duly designated as the DB5 Volante sports car. These variants differed from the earlier DB5 convertibles by incorporating the split front and rear bumpers, used in the forthcoming DB6, and using rear lights from the Triumph TR4. 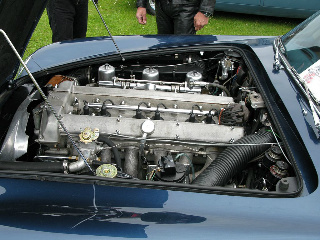 When production ended in 1967, a combined total of 123 units of the convertible were built, with 12 being fitted with the more powerful Vantage engine. 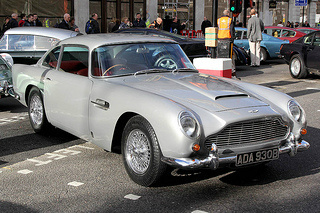 In September 1964, a variant of the DB5 coupe was launched, and designated the DB5 Vantage sports car. This resulted in an engine that developed 325 bhp at 5000 rpm, and 288 ft/lbs of torque at 3850 rpm. Fitted with a robust all synchromesh, ZF five speed manual gearbox, this produced a top speed of 162 mph, with a 0-60 mph time of 5.9 secs. 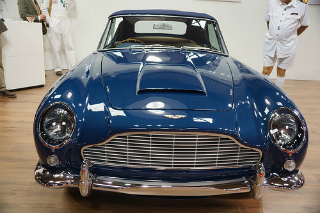 By the time production ended in 1965, only 65 units of the DB5 Vantage variant were built. 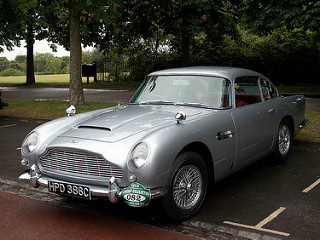 In order to cater for the hunting fraternity, and dog lovers in general, Aston Martin introduced the estate version of the DB5, which was designated the DB5 Shooting Brake. Accordingly, the specialist coachbuilder, Howard Radford, modified the rear section of around twelve DB5 coupes, to produce this limited edition variant. As with the Volante, the tail lights were courtesy of the Triumph TR4 sports car. 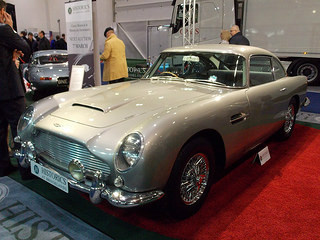 On of the DB5 sports cars used in the film "Goldfinger" sold at auction for $4 million/£2.6 million.